Plays in contemporary Nepali theatre encompass a vast range of genres and subject matter, ranging from global traditional and contemporary theatre plays — from Western and Asian — to distinctly Nepali. 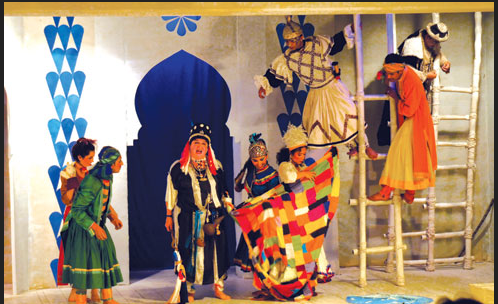 The Mandala Theatre’s programme of plays reflects this well. In his article in the online English language ‘My Republica’ news journal Ashish Dhakal provides an invaluable insight into the world of contemporary Nepali theatre plays, and the opportunities and challenges before contemporary Nepali theatre, its playwrights, actors and directors. In his 2008 book ‘Theatre for Transformation’, Ghimire Yubaraj, a famous theatre artist for 15 years now, states that every theatre in the world has its root in culture. “Every ancient theatre started as a form of honoring the Gods,” he says.